New Delhi: Riding on the back of the popularity of its latest hatchback, the Baleno, Maruti strengthened its position as the country’s top manufacturer in the month of May, 2016. The Baleno breached the 10k sales mark last month, taking Maruti’s tally to as many as seven cars among India’s 10 top-selling ones. 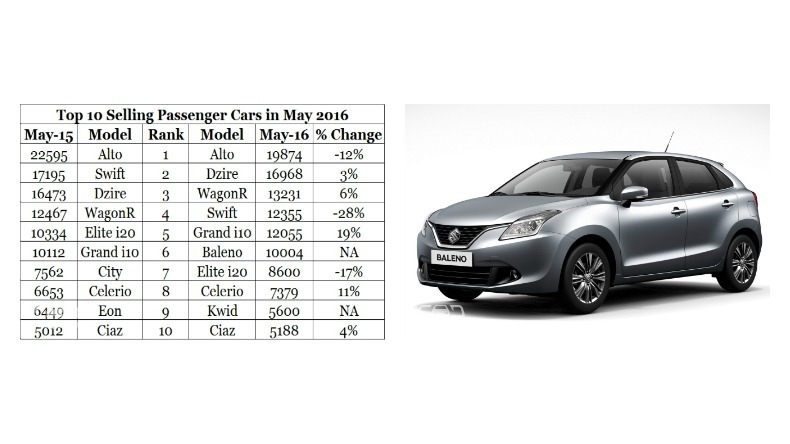 The Baleno is not only a hit in the domestic markets but also an in-demand set of wheels abroad, as indicated by its exports figures. It had helped Maruti achieve its highest sales in the previous financial year and it carried forward the same volumes last month, selling 10,008 units. The top four positions, as has been the case in the past months, were occupied by the Maruti quartet of Alto, DZire, WagonR and Swift. The Alto remains the undisputed king of the Indian market despite a 12 percent YOY drop in sales at 19,874 units. The Swift fell down to fourth from last year, retailing 12,355 units – a huge 28 percent drop from last year. Elsewhere, the month of May was a mixed bag for the country’s second largest automaker Hyundai. While its Grand i10, in at fifth, registered a phenomenal 19 percent rise to 12,055 units, the Elite i20 fell to seventh after a 17 percent nosedive at 8,600 units. The only non-Maruti/Hyundai car on the list, the Renault Kwid proudly flaunted its consistent popularity in the Indian markets with 5,600 units and landed at the ninth position in last month’s charts. Maruti’s hybrid car Ciaz sealed the pile with a four percent rise at 5,188 units, showing the impact of the diesel blanket ban in Delhi.